Ponce Inlet in North Florida is a fairly exposed beach/Jetty break that has consistent surf and can work at any time of the year. Offshore winds blow from the southwest. Groundswells and windswells are equally likely and the ideal swell direction is from the southeast. The beach breaks favour rights. Best around high tide. A popular wave that can get growded. Watch out for rips, rocks, locals and sharks. For Ponce de Leon Inlet (inside), Florida, 2 km from Ponce Inlet. At New Smyrna Beach Municipal Airport (FL), 4 km from Ponce Inlet. The two graphs above are also combined in the single Ponce Inlet surf consistency graph. Also see Ponce Inlet surf quality by season and Ponce Inlet surf quality by month. Compare Ponce Inlet with another surf break. If you plan to be there in the early morning or evening; then bring some insect repellent, or be prepared to suffer from a million little noseeum (sandfly) bites. Strong current with lots of rocks. Use heavy line and bring a landing net with a long pole, if you have one. Use a "sacrificial leader" or "breakaway leader" for your weight, and be prepared to lose some tackle. Great light tackle setup: Use 40lb braid connected to 18" of 40-60lb mono leader. Connect your braid to your mono using a properly rated black swivel. If you get hung up on rocks; tighten your drag, drop your rod tip, pull back slowly, a foot or two at a time...using the setup described, the hook on your tackle will straighten and release before your line will break. For big bull drum: use a heavy weight and leader and at least a 5.0 hook, take a crap, break off legs and claws, peel shell off to expose crab meat, hook through leg sockets on one side of crap. Cast and wait. Jig head combo: try a 1/2oz chartreuse jig head with a gulp "natural" shrimp...these have white bellies and dark green flake body. Work VERY slowly, hopping along bottom. The closest passenger airport to Ponce Inlet is Executive (Orlando) Airport (ORL) in USA, 72 km (45 miles) away (directly). The second nearest airport to Ponce Inlet is Orlando International Airport (MCO), also in USA, 82 km (51 miles) away. Third is Patrick Afb (Coco Beach) Airport (COF) in USA, 99 km (61 miles) away. Melbourne International Airport (MLB) in USA is 112 km (70 miles) away. Gainesville Rgnl Airport (GNV), also in USA is the fifth nearest airport to Ponce Inlet and is 148 km (92 miles) away. This is the Surf-Forecast page for Ponce Inlet, Florida - North. Use the tab navigation above to view Ponce Inlet sea temperature, Ponce Inlet photographs, Ponce Inlet detailed swell predictions, wind and weather forecasts, Ponce Inlet webcams, current wind from Florida - North live weather stations and Ponce Inlet tide predictions. 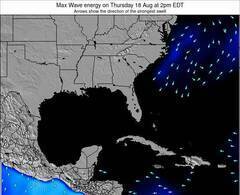 The United States swell maps link will open up the big picture showing United States and the surrounding seas. These swell maps can be animated to show the different swell components, wave energy, wave period, wave heights, together with wind and weather forecasts, current weather and sea state observations from United States wave-buoys, passing ships and coastal weather stations. Each of the forecast pages for this surf break feature a global and regional wavefinder tool to locate the best surf conditions in the area around Ponce Inlet.